Pet and dog groomers, like other business owners, generally believe that they are providing a valuable service and are eager to make their living by it. However, anyone who has tried to run a business can tell you that it is hard and comes with many unexpected costs and obstacles. Clients sue over nails getting trimmed too closely, tubs break under particularly feisty dogs, and leashes fray and snap as they age. These expenses can sink a business if it isn't properly insured. There are a few types of policies that every pet groomer will find useful for their business. A pet grooming business often finds it cost-effective and convenient to buy certain types of insurance in one group. This group is called a business owner's policy, sometimes referred to as BOP. It's a way of keeping all the types of insurance that you need on one bill. Pet groomer BOP's tend to include professional liability, general liability, and a couple of policies that cover the business's property. The type of property insurance that will be offered as part of the bundle varies by company, and you can always ask about adding policies to your BOP when you talk to your insurance agent. Pet groomers are doing a tricky job with other people's beloved (and possibly wiggly) fur babies. This situation carries the inherent risk of clients accusing them of professional negligence or malpractice, which can lead to the business paying out a lot of money. Professional liability insurance covers the cost of paying for the claims and the defense up to the limit of the coverage. Often, the insurance policy will be structured so that it covers up to a million dollars per claim, but the details vary from company to company. You will have to shop around to find something that fits your company's needs. Sometimes, pet groomers are sued because of something that happened that isn't part of their job. The classic example is a client slips while waiting in the lobby for the groomer to finish with his or her pet. This is why general liability is sometimes called 'slip and fall' insurance, but it can cover a wide array of events. It might cover a client suing because you accidentally broke a soap dish while making a house call, or an employee backs the van you use as a mobile grooming station into their mailbox. There are some policies that cover claims that a pet got injured at your business. The particular situations that your general liability policy will cover depend on the company, as does how much of the claims the policy will cover. Dog and pet groomers use a lot of equipment. There are kennels, leashes, brushes, and many other things that can get broken by a rambunctious puppy or a clumsy employee. Commercial property insurance will cover the costs of replacing or fixing them up to a certain amount. Some companies will customize such policies to cover either property permanently attached to your grooming van or the equipment that you keep at the building you rent for your business. Anybody who provides a service faces a problem if they have to temporarily stop providing the service. Perhaps the room that you rent was damaged and you couldn't do your job there while it is getting fixed. You would lose income in that circumstance unless you had business income insurance. Business income insurance covers a couple of weeks of income while your property is getting fixed so long as the type of damage that your business sustained is covered by the policy. Be sure to ask your insurance agent about adding likely types of damage to it. Most states require that you have insurance for when employees get hurt on the job. 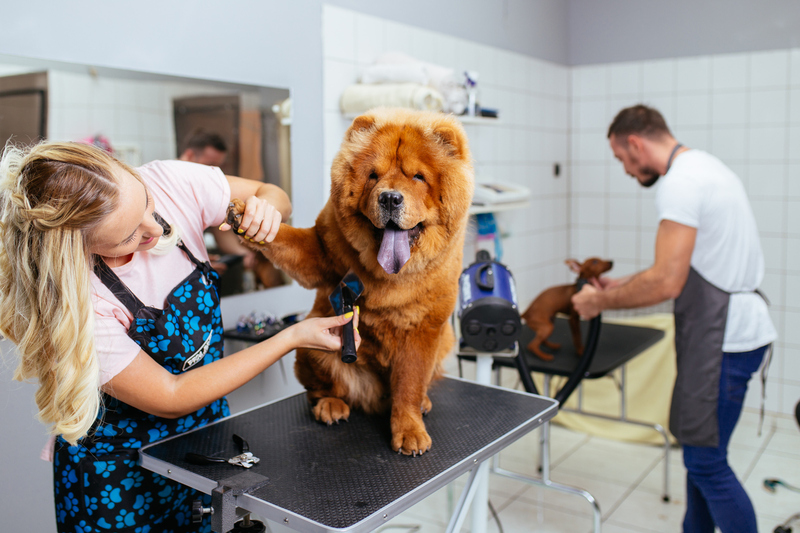 You can see why: groomers face pets with sharp claws and fangs who may object to soapy water, and there are plenty of sharp pieces of equipment with which they can jab themselves. If they get injured, they should have the medical coverage necessary to pay for a speedy recovery. The insurance that covers employees getting hurt at work is called worker's compensation, often called workmen's comp. Now that you have identified the types of insurance that your business needs, It's time to get a quote, maybe even a few quotes to make sure you get the best policies for you. Commercialinsurance.net is happy to get you a quote. All you have to do is type your zip code in the provided field above and click 'Let's start.' A representative will then contact you to start generating quotes. If you would rather call us directly, you can call at 1-800-907-5267.